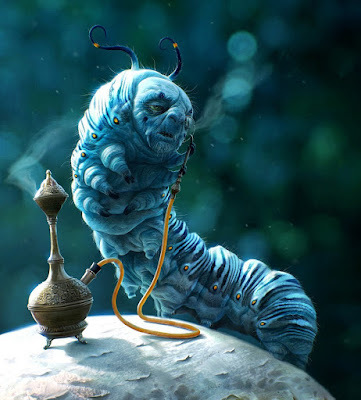 “The Caterpillar and Alice looked at each other for some time in silence: at last the Caterpillar took the hookah out of its mouth, and addressed her in a languid, sleepy voice. “Who are you?” said the Caterpillar. This was not an encouraging opening for a conversation. Alice replied, rather shyly, “ I—I hardly know, sir, just at present—at least I know who I was when I got up this morning, but I think I must have been changed several times since then.” “What do you mean by that?” said the Caterpillar sternly. “Explain yourself!” “I can’t explain myself, I’m afraid, sir,” said Alice, “because I’m not myself, you see.” “I don’t see,” said the Caterpillar. “I’m afraid I can’t put it more clearly,” Alice replied very politely, “for I can’t understand it myself to begin with; and being so many different sizes in a day is very confusing.” “It isn’t,” said the Caterpillar. “Well, perhaps you haven’t found it so yet,” said Alice; “but when you have to turn into a chrysalis—you will some day, you know—and then after that into a butterfly, I should think you’ll feel it a little queer, won’t you ?” “Not a bit,” said the Caterpillar. “Well, perhaps your feelings may be different,” said Alice; “all I know is, it would feel very queer to me.” “You!” said the Caterpillar contemptuously. “Who are you?” Which brought them back again to the beginning of the conversation. And oddly enough, even in her young age, she immediately recognizes that he is not simply asking for her name, but is asking on a deeper, existential level, “Who are you?” And she doesn’t know anymore. By this time in the book Alice has already been through so much. She has gone through changes, seen so much, that she is questioning everything she ever thought was true. Her whole world has been turned upside down, to the point that she is now questioning her entire existence. So to answer the question, “Who are you?” is no easy task. Director Tim Burton, in his 2010 film version of this old story, explores this identity crisis even further. In that movie, a prophecy states that someone by the name of Alice will slay a dragon that has been terrorizing the land. And when she meets the caterpillar for the first time, the white rabbit asks him, if this is that Alice, and his answer is, “hardly.” Alice assumes “hardly” means no, because slaying dragons isn’t the business of a young woman, right? I appreciated the directness of the question and I went into my usual spiel about the differences between the Lutheran denominations but it turns out she already knew enough of all that because when she learned that we were an ELCA congregation, she let out a sigh of relief and said, “Oh good. I’ve been to the others, and didn’t feel welcome there.” I could tell there was a story or two behind that statement but it was not the time or the place to get into all that. And though it was nice to hear that we are becoming known for being a welcoming denomination, it did make me wonder if we are saying that loud enough. How often are we even saying it out loud? For John the Baptist, who he was, was defined by what he was called to do, to be a voice, a voice in the wilderness. I believe that’s our call too, to be a voice in the wilderness. And the wilderness can be a variety of things, all at the same time, and the wilderness that has been foremost on my mind, our dragon if you will, is a wilderness of voices. I mentioned earlier about the polarization of the world and our nation, and that’s part of it. And in this state of polarization that we find ourselves in, there are so many voices. Loud voices! Competing voices! Some are loving voices but there are so many hateful voices out there too. And some of them are coming from Christians. But our calling is not to change their minds. Good luck with that anyway! Our calling, our job, is to be a voice—a voice of equal volume, of equal confidence, of equal passion. But before we are a voice we have to know who we are. The world is asking, “Who are you?” What is our answer? Like, John, our answer is based on what we do. Do we love people of all colors? Then say it! Out loud! Let me tell you something, as a person of color, I need to hear those words! Especially from my white sisters and brothers! Because it is not a given everywhere I go! Do we love people of all sexual orientations? Then say it! Out loud! Because it is not a given everywhere they go! Do we love women and give them equal places of leadership? Then say it! Out loud! Because it is not a given everywhere they go! Do we love the environment? Do we love visiting people? Do we love feeding people? Then we need to say it. Out loud. For all to hear. Because those things aren’t givens, everywhere we go. And we cannot leave it up to visitors to assume such things, because they may assume wrong, based on the many other voices that are outside these walls. I’ve been your pastor for long enough to see that you have a pretty good grasp of who you are. It’s been a long road, with twists and turns, and your share of bumps and bruises, but because of that, it has helped you to find yourselves, to discover who you are, who you have become, in order fulfill your calling here in this place. And like John the Baptist and Alice in Wonderland, once you know who you are, it’s time to proclaim it, out loud, for all to hear—to be a voice, in a wilderness of voices. Thanks be to God. Amen.